Calorie-free table-top sweetener based on Steviol Glycosides. Sweetness from the stevia leaf. 0 kcal. Gluten-free. Suitable for vegans. Kosher.The 100% made from natural sources zero calorie sweetener Enjoy the great tasting sweetness in SteviaSweet which comes from the leaves of the Stevia plant, combined with other ingredients. 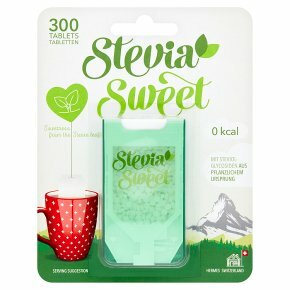 SteviaSweet Tablets are the smart new way to sweeten your favourite drinks, with 2 tablets providing the same sweetness as a teaspoon of sugar. Zero kcal per 2 tablets compared to 20 kcal for a teaspoon of sugar. All the sweetness but without the calories.